Financial professionals who have taken and passed the Series 6, 7, 63, 65 or 66 exams know that an arrest and conviction can decimate careers regulated and overseen by FINRA. Many of these men and women, however, are unaware that New York State allows people with no more than two criminal convictions, of which only one can be a non-violent felony, to apply to have their criminal record sealed pursuant to NY Criminal Procedure law 160.59. Although not expunged, once the record is sealed, except for some specified organizations and law enforcement agencies, employers and the general public are prevented from “seeing” their past. With the above in mind, the following questions come time mind that are worthy of review with a lawyer versed in New York sealing law. 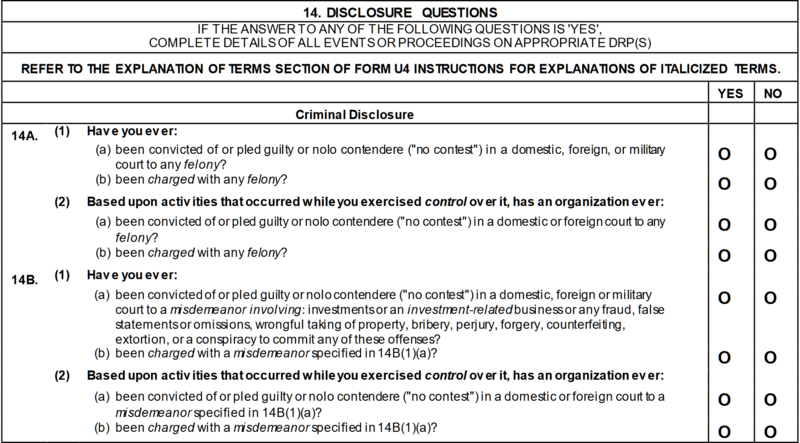 If, for example, you were convicted of Assault, Criminal Possession of a Controlled Substance or even Grand Larceny, must you disclose on your FINRA U4 the old arrest and criminal conviction if you successfully had the same sealed? For that matter, if you already shared the information as broker-dealers are obliged, is there a way to remove these records or prevent FINRA from keeping or sharing your history or taking adverse actions? Simply (albeit, not that simply), before responding to Criminal Disclosure questions 14A and 14B and determining how to protect yourself if you already disclosed a now sealed criminal conviction, it behooves you to discuss your specific matter with a knowledgeable attorney experienced in NYS’s pseudo-expungement law, FINRA’s U4 and relevant statutes including NYS Human Rights Law 296(16). With the above being the most important elements for eligibility, your counsel must also secure your certificate of disposition, old case file and present a compelling argument to your sentencing judge or judge now presiding in that court, that you are worthy of case sealing. An easy task or lift it is not and the law allows for prosecutors to challenge your application and a judge to hold a hearing before making his or her determination. Before answering 14A and 14B of FINRA’s U4, its critically important to read Human Rights Law 296(16). In pertinent part its states that “[i]t shall be an unlawful discriminatory practice…to make any inquiry about, whether in any form of application…any arrest or criminal accusation of such individual not then pending against that individual which was followed by a termination of that criminal action or proceeding in favor of such individual…” including those sealed pursuant to CPL 160.59. 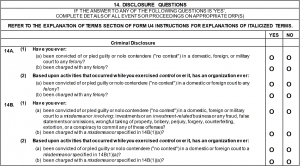 Barring a statutorily identified exception, and one does not exist here, would a now sealed conviction be discoverable by FINRA when you are asked whether you have ever been accused or convicted of a felony or a misdemeanor involving fraud, false statements or a wrongful taking or property among others? The answer, it seems, is a firm “no.” For that matter, the statute indicates that in this state, FINRA or any employer should not even be asking the question about past arrests and those matters resolved in your favor. Again, although addressed fairly simply, there is no written rule confirming that FINRA will take a particular stance on your sealed conviction or one that you subsequently sealed. Moreover, Massachusetts, California and New York each have their own respective law. As such, what happens in New York may differ from other states. Assuming, however, that your attorney is successful and a judge grants your motion, consult with counsel before answering the U4 questions to best prepare yourself should FINRA confront you on your response. Moreover, if you cleaned up your past history, it may be a worthy conversation to identify whether you can and the best strategy to compel FINRA to clean up their records as well. To learn more about CPL 160.59, regardless of your current career and licensure, review the materials found through the above links. Crotty Saland PC is a New York criminal law firm founded by two former Manhattan prosecutors. Crotty Saland PC represents clients in case sealing applications throughout the State of New York.